In 1990, Amateur Radio hidden transmitter hunting in the USA was almost exclusively a vehicular activity. A weekend hunt meant hours of driving in a well-equipped vehicle. There might be an on-foot "sniff" at the end to get to a transmitter a few yards off the road, but that was the extent of radio "foxhunting" on foot. Back then, only a handful of North American hams had experienced the kind of transmitter hunting that was predominant in Europe and the Asian mainland. In those countries, hams had combined radio direction finding (RDF) with map-and-compass orienteering to create a sport that challenges both the mind and body. In some places, particularly Russia and former Soviet bloc nations, it was being used in physical education classes for youth in schools and by the military for field training. This international on-foot-only sport had acquired several names including foxtailing, foxteering, radio-orienteering and ARDF, for Amateur Radio Direction Finding. A standard course has five "fox" transmitters in a large wooded area of at least 500 acres, usually much larger. Participants start near one end and proceed to the other, plotting bearings on a special topographical map and punching in at each fox along the way. Radio-orienteers must pay constant attention to all bearings, because each fox is on for 60 seconds, one at a time, in sequence. For instance, when #1 goes off, then #2 comes on and #1 won't be back for four minutes. Usually a continuous transmitter on a separate frequency is near the finish to aid hunters who have lost their place on the map. The first foxtailing events were on 80 meters with CW transmitters sending "MO" followed by dits indicating the transmitter number (MOE, MOI, MOS, MOH, and MO5). Later, a separate contest on two meters was added to each meet, with CW tones on AM carriers. This was before the popularity of narrowband FM on two meters, but AM predominates on VHF at international ARDF events to this day. Starting with separate divisions for all men and all women, the organizers began to add categories for youth and "old timers" as teenagers joined in and many regular participants reached the ripe old age of 40. At that time all women, regardless of age, were placed into a fourth category. In the 1970's, European on-foot transmitter hunters began staging international contests. This required a standard set of rules for all nations, which were developed by a committee of the International Amateur Radio Union (IARU) and used for the first ARDF World Championships in 1980. These rules have been modified over the years to add to and revise the age/gender categories, improve starting procedures, and so forth. The detailed IARU document "Rules for Championships in Amateur Radio Direction Finding" is maintained by IARU's ARDF Working Group, comprising delegates from foxhunting countries around the world. It calls for five low-power (0.25 to 1.5 watt) foxes, automatically transmitting one after another (never at the same time) on the same frequency for exactly one minute each. Contestants attempt to locate as many as possible and get to the finish within the time limit, carrying a card to mark with the unique punches located at each fox. (A computerized registration/scoring system may also be used.) The start and finish may be at the same place, but usually they are at widely spaced points of the course. Contestants are individually timed. They start at intervals, usually every five minutes, coinciding with the start of fox #1 transmissions. This scatters the contestants on the course to minimize "follow the leader" problems. Winners are determined primarily by the number of transmitters found and secondarily by elapsed time. Foxhunting is a map and compass exercise as well as a test of direction-finding skill. Successful hunters pay careful attention to their own location and the bearings to all foxes at all times, plotting them on detailed orienteering maps provided by the organizers. They know that if they miss a fox bearing, they must wait four minutes to hear that fox again. They also eye their watches, since exceeding the time limit (usually two to three hours) means disqualification. In other words, it is better to return under the limit with only one fox found than to find all five but take one minute over the limit. Those are the minimum number of transmitters to be found per the latest rules. The organizers of an event have the option to add additional required transmitters to categories as they see fit. For instance, category W21 was required to find all five transmitters in the 2010 World Championships in Croatia. The MOx numbers of transmitters to be found in each category are determined by the organizers; it is not up to the discretion of the hunters. In championships where there are sufficient youth competing, some or all of the following additional categories may be added: M12, M14, M16, W12, W14, W16. Transmitters must be at least 400 meters apart, with a total optimum-route course distance of 6 to 12 kilometers. Elevation change should not exceed six percent of the course length. The first fox should be at least 750 meters from the start. A prominent red and white prism (orienteering flag) is located close to each transmitter for visual identification. This is where the registration device (manual or e-punch) is located. A homing fox at the finish line transmits continuously on a separate frequency to aid competitors who get lost. Two meter foxes in European and Asian IARU championships use AM with tone modulation, but FM tones are often used in North America. There is also a separate contest on a different day in all age/gender catetories on 80 meters, with keyed CW transmitters. In about 30 countries where international-style foxhunting is popular, there are local and wider area events, leading up to annual national championships. In even-numbered years, one nation hosts the World Championships. Each country entering the World Championships may field one team of up to three contestants in each category. In odd-numbered years, IARU encourages each of the three regions to hold Regional Championships, hosted by countries in the individual regions. At championships, gold, silver and bronze medals are awarded in each age/gender category, individual and team, for both bands. Sometimes there are formal ceremonies with display of the flags of winning countries and the playing of national anthems. To avoid the advantage of familiarity, championship venues must not have been used for open ARDF competitions for at least two years prior. When locations are selected, the organizers usually place them on embargo, meaning that they are off-limits to any person who will be in the future ARDF competition. Not only are they off-limits for ARDF, they are off-limits for hiking, camping, orienteering, etc. Put simply, any attempt to survey or train in the areas embargoed by the organizer, or to gain any advance information about the courses beyond that provided by the organizers, is not allowed and could be grounds for disqualification. Compared to American-style mobile T-hunts, an international-rules on-foot foxhunt is usually a much more formal event. It takes much preparation and on-site staffing to put on ARDF championships. On the other hand, radio-orienteering practice and training sessions can be very informal. Setups can be done by just one or two hams and IARU's rules can be modified as appropriate. For instance, no age categories are necessary if there are only a few participants. Flags may be eliminated in barren areas or where theft may be a concern. Smaller venues, fewer fox transmitters, and different transmitter timings are other options. The first ARDF "world" championships in 1980 attracted participants from eleven European countries. Asia was not represented until four years later, but activity grew quickly there, especially in China and Japan. By the mid-1990s, over twenty countries were participating, but IARU officials were bemoaning the "black hole" in Region 2 (North and South America), where no formal foxtailing was taking place. That was about to change, because some hams on our West Coast had tried ARDF, liked it, and wanted to move it into the mainstream of American ham radio. The first formal multi-national foxhunt on US soil took place in May 1991. It was put on by the Friendship Amateur Radio Society (FARS) of Portland, Oregon. FARS came into being as the result of a Sister Cities arrangement between Portland and Khabarovsk, a similar-sized city in Asiatic Russia. Ham operators of Khabarovsk invited a delegation of Portland hams to their home city in 1989 for a series of radiosporting events, including a European/Asian style foxhunt. Everyone had so much fun that it was decided to hold future Friendship Games every two years. 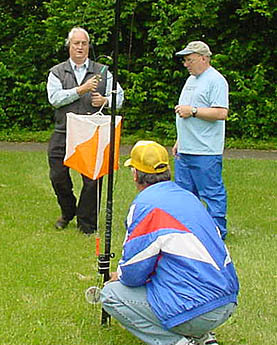 Portland hams reciprocated by putting on the second Friendship Radiosport Games (FRG) in their city, including a two-meter ARDF session in giant Forest Park. Read Homing In for September 1991 and "Showdown in Portland" in the November 1991 issue of 73 Amateur Radio Today Magazine for firsthand reports on FRG-91. Victoria, BC Canada, another Khabarovsk sister city, hosted the next Friendship Games gathering in 1993 with the first two-meter ARDF event in that country. By then, there were FARS chapters in USA, Russia, Japan, and Canada. Hams from all these countries participated in the hunt, plus DX and CW sending/receiving contests. Read October 1993 Homing In for all the details of FRG-93. The 1995 Friendship Games returned to Khabarovsk, with participants from all four countries again in attendance and another radio-orienteering event. The story is in Homing In for December 1996. Also in that year, Hamcon/Foxhunt-95 was staged at the ARRL Southwestern Division convention with thirty participants scouring Angel's Gate park on foot in search of hidden transmitters. It was so successful that another formal foxhunt was a feature of the 1996 West Coast VHF/UHF Conference. For more about Hamcon/Foxhunt-95 and the 1996 Conference hunt, read Homing In for December 1995 and January 1996. Japan hosted the next Friendship Games in 1997. Because the primary activity of Japan's host club is foxhunting, the foxhunt was the main event. It was fully covered in Homing In for January 1998. The Friendship Games gave us good ARDF experience, but they were not IARU-sanctioned events. In 1996, Kevin Kelly N6QAB was the first stateside ham to participate in an IARU radio-orienteering contest when he traveled to the Region 3 Championships in Townsville, Australia. In addition to Region 2, ARRL is a dues-paying member of IARU Region 3 because of the American territories in the western Pacific. Therefore, USA competes as a Region 3 country in that region's championships. Kevin recounted his experiences in the Homing In column for December 1996. The three photos at right are from that event, courtesy of Kevin and his wife Susan. In fall 1997, a small group of hams across the USA and Canada formed the North American ARDF Organizing Task Force to promote the sport. The American Radio Relay League (ARRL) formally recognized this increasing interest at its January 1998 meeting of the Board of Directors. ARRL's President was authorized to appoint an ARDF Coordinator (Joe Moell KØOV) to work with hams here in the USA and abroad to promote the sport and arrange for competitions. E-mail and personal contacts between the ARDF Coordinator, the Task Force members and other ARDF enthusiasts around the world led to an invitation for our presence at the 1998 IARU ARDF World Championships in Hungary. The call for participation went out and six persons responded. After several informal local foxhunting practice sessions and a formal training event in southern California, they were ready for the big September event. All had a great time in Hungary. They learned a great deal about techniques used by foxtailing winners and about the organization of ARDF championship events. You can read all the details in two feature articles: "The USA Takes on the World Foxhunting Championships" by Joe Moell KØOV in the March 1999 issue of CQ VHF Magazine and "Amateur Radio Direction Finding--The 1998 IARU World Championships" by Dale Hunt WB6BYU in the May 1999 issue of QST Magazine. Homing In for January 1999 also covered this event. Later that month, the IARU Region 2 Plenary Conference in Venezuela approved a request by FARS to include IARU Region 2 ARDF Championship foxhunts as part of the 1999 Friendship Radiosport Games (FRG-99) in Portland, Oregon, staged during the second week of August 1999. Dale Hunt WB6BYU, Team Leader for the Hungary trip, agreed to be Foxhunt Chair for this event. In June 1999, Joe Moell KØOV was appointed as the first IARU Region 2 ARDF Coordinator. The first IARU Region 2 ARDF Championships in Portland brought hams from six European and Asian countries to take on fifteen Team USA members and five Team Canada members representing Region 2. In addition to the two-meter foxhunt, the first-ever multi-nation 80-meter foxhunt in the Western Hemisphere took place there. V.I.P attendees included Tom Atkins VE3CDM, IARU Region 2 President and Rik Strobbe ON7YD, who was Interim Chair of IARU Region 1 ARDF Working Group at the time. Homing In for October 1999 covered these historic Championships in detail. With the successful Portland event as impetus, year 2000 was much more active for ARDF in the USA. Dozens of two-meter practice on-foot hunts took place from California to North Carolina, and several places in between. Many of these sessions helped prepare Team USA members for the 2000 ARDF World Championships (WCs). The Team USA Qualifying Runs, held June 3-4 in southern California, had the longest 2-meter and 80-meter ARDF courses in North America to date. Twelve persons represented USA at the ARDF World Championships in Nanjing, China during October 2000 including 15-year-old Jay Thompson W6JAY, whose mother is of Chinese descent. Dale Hunt WB6BYU became the first person from the Western Hemisphere ever to serve on the International Jury at the ARDF WCs and Bob Cooley KF6VSE became the first Team USA member to finish in the top ten of his category. Read more about the 2000 WCs in Homing In for January 2001. Even more ARDF activity occurred in the USA during 2001, including the First USA ARDF Championships in Albuquerque, New Mexico. Over 40 radio-orienteers from the USA, Australia, China and Ukraine took to the courses. Homing In for February 2001 and ARRL's QST Magazine for May 2001 had detailed pre-event articles. Follow-up Homing In articles were in the December 2001 and January 2002 issues of 73 Magazine. Some USA ARDF enthusiasts also participated in the Friendship Games foxhunt in Victoria, BC during the week after the Albuquerque events. Dale Hunt WB6BYU was appointed to be IARU Region 2 ARDF Coordinator in October 2001, replacing Joe Moell KØOV, who resigned to concentrate on stateside ARDF development as USA ARDF Coordinator. 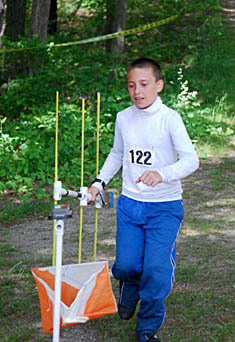 In April 2002, the Georgia Orienteering Club hosted the Second USA ARDF Championships. Read all about it in Homing In for July and August 2002. The Championships were also featured as a cover article in Monitoring Times magazine for July 2002. Members of Team USA 2002 were selected from the best performers at this event and at the 2001 Albuquerque hunts. These eleven Team USA competitors and one International Jury member traveled to Slovakia during the first week of September for the 2002 ARDF World Championships. USA's performance was the best ever, including one fourth place and one fifth place in the individual standings. Homing In columns covered our WC participation in the November and December 2002 installments. 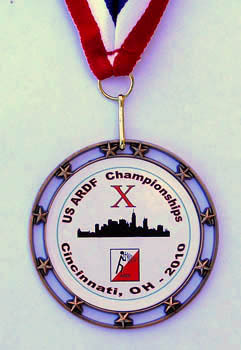 The Third USA ARDF Championships took place near Cincinnati, Ohio from July 30 through August 3, 2003, hosted by the OH-KY-IN Amateur Radio Club. It was also designated as the Second IARU Region 2 ARDF Championships. Detailed coverage was in Homing In for Winter 2004, my first column after the move to CQ VHF Magazine. 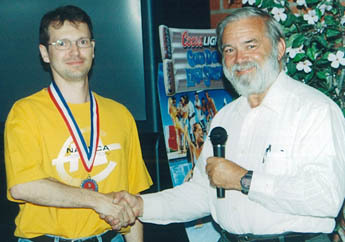 Santa Barbara Amateur Radio Club in California hosted the Fourth USA ARDF Championships, June 16 - 19, 2004. Homing In for Summer 2004 covered some unique aspects of these events, including the first use of electronic scoring in our national championships. This took place just in time for final selection of ARDF Team USA 2004 members, who traveled to Brno in the Czech Republic for the 12th ARDF World Championships in September. USA's team positions were filled based on performances in the 2004 events in California and the 2003 events in Ohio. In addition to competitors and spectators, USA sent two persons to participate in the international jury at these World Championships. Also in 2004, Portland hams traveled to Khabarovsk for the Eighth Friendship Games. The Fifth USA ARDF Championships and Third IARU Region 2 Championships returned to Albuquerque, New Mexico during the first week of August, 2005, with participants from USA, Australia, Kazakhstan and the Czech Republic. 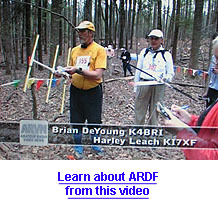 The Sixth USA ARDF Championships took place April 7 - 9, 2006 in Raleigh, North Carolina, after which the members of ARDF Team USA 2006 were selected. 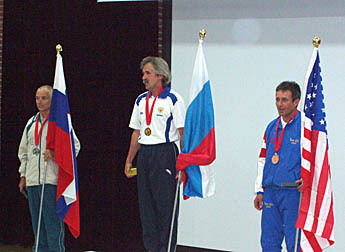 In September 2006, the team traveled to the Black Sea coast of Bulgaria for the 13th ARDF World Championships, where Team USA captured its first WC medal. 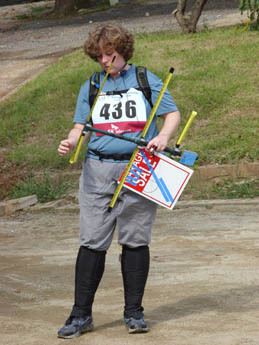 Nadia Scharlau of North Carolina was awarded a tie for third place on 80 meters in the four-fox category for women over 35. She would have won it outright, but the homing beacon transmitter failed just as she punched in at her last fox and needed the beacon to navigate quickly to the finish line. After a thorough review, the international jury gave her the medal. More about both events was in my Homing In column for Fall 2006. The Seventh USA ARDF Championships and Fourth IARU Region 2 Championships took place September 14 - 16, 2007 near Lake Tahoe, which is on the California/Nevada border. It was well covered in this site and in Homing In for Fall 2007. Also in 2007, hams from Cincinnati staged the first USA Blind ARDF Championships at the Dayton Hamvention (photo above right). 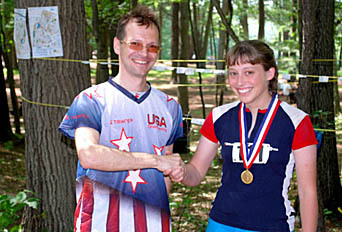 The Eighth USA ARDF Championships were in a big park near Bastrop, Texas from May 8 through 10, 2008. Following that, Team USA members were selected for the 14th ARDF World Championships in South Korea during September. Both were detailed in Homing In for Fall 2008. At the World Championships, George Neal KF6YKN won bronze in his category (photo at right) and three other Team USA members placed in the top ten of their categories. Also in 2008 were the Ninth Friendship Radiosport Games (FRG-08) in Portland, Oregon, August 1 - 3. The Ninth USA ARDF Championships and Fifth IARU Region 2 Championships were near Boston, Massachusetts from June 5 through 7, 2009. This was first ARDF championship event in a northeastern state. A detailed report is in Homing In for Summer 2009. 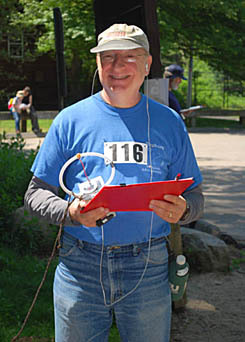 Radio-orienteers returned to the Cincinnati area in 2010 for the Tenth USA ARDF Championships, which took place May 21-23. A detailed report is in Homing In for Summer 2010. Team USA then formed and traveled to the 15th ARDF World Championships in Croatia from September 13 - 18, where three team members won medals. Homing In for Fall 2010 has the full story. For the first time, Radio Amateurs of Canada (RAC, the national association of hams in that country) also sent a team to the World Championships. Another event in Croatia during that time was the First ARDF World Championships for the Blind. One competitor from USA took part in that. The Eleventh USA ARDF Championships and Sixth IARU Region 2 Championships took place near Albuquerque, New Mexico on the weekend of September 16 - 18, 2011. A detailed report is in Homing In for Fall 2011. The Twelfth USA ARDF Championships took place in the mountains east of San Diego, California June 1 through 3, 2012. Results and photos are in this Homing In Web site and a detailed report is in Homing In for Summer 2012. Team USA traveled to the 16th ARDF World Championships in Serbia from September 10 - 16, 2012. Team USA members brought back thirteen medals, the most ever by a USA ARDF team. That story is in Homing In for Fall 2012. The Thirteenth USA and Seventh IARU Region 2 ARDF Championships were in the Birkhead Mountain Wilderness of North Carolina from October 9 - 13, 2013 with competitors from USA, Canada, China, Germany, Russia, Sweden, United Kingdom and Ukraine in attendance. My article about it was in the May 2014 issue of CQ-Plus Magazine. The Fourteenth USA ARDF Championships were near Boston, Massachusetts from June 5 - 8, 2014. Team USA then competed in the 17th ARDF World Championships in Kazakhstan from September 6 - 13. A detailed report on both is in Homing In for December 2014. The Fifteenth USA and Eighth IARU Region 2 ARDF Championships took place in eastern Colorado from August 27-30, 2015. It was covered in full in the November 2015 issue of CQ Magazine. Texas hosted ARDF again in 2016 as radio-orienteers gathered for the Sixteenth USA ARDF Championships at a youth camp near Killeen from April 6-10. Details are in Homing In for August 2016. ARDF Team USA members were then selected and traveled to the 18th ARDF World Championships in Bulgaria during September. Hams in the Cincinnati area organized the Seventeenth USA and Ninth IARU Region 2 ARDF Championships in August 2017. A full report is in Homing In for November 2017. The Eighteenth USA ARDF Championships were in the Tahoe National Forest of California in June 2018. Competitions were near Little Truckee Summit with an excellent new map. Then ARDF Team USA formed and traveled to Sokcho, Korea where members won more medals than ever in the 19th ARDF World Championships. Full reports are in the September and November 2018 Homing In columns. Dale Hunt WB6BYU retired from his position as IARU Region 2 ARDF Coordinator in August 2018. Taking this position is Ken Harker WM5R of Austin, TX. Registration is now open for the Nineteenth USA and Tenth IARU Region 2 ARDF Championships, which will take place July 28 through August 4, 2019 near Raleigh, North Carolina. Because it is both a mental and physical challenge, ARDF appeals to both "techies" and "jocks" of all ages. It takes skill to get proper bearings, plot them, set a course and navigate through the woods. It takes physical conditioning to do it faster than your fellow competitors. Perhaps you or a fellow club member have what it takes to become a champion. Your children and grandchildren might, too. And what about your local Scout troop? Remember, a ham license is not required to receive and track fox signals. You don't have to be a combination of rocket scientist and marathoner to have foxtailing fun. There is a lot of trotting, walking and pausing on the course, plus a lot of head-scratching when the bearings don't to make sense. There is also immense satisfaction for each person who completes the course, no matter how long it takes. If ARDF activities have begun in your area, get involved. If they have not started yet, get the ball rolling by talking to your club about it and become a local ARDF Point of Contact. Send e-mail to the USA's ARDF Coordinator Joe Moell KØOV to get on the PoC list. If you live in Canada, contact ARDF Coordinator Joe Young VE7BFK. If you are in another country of North or South America besides USA and Canada, contact IARU Region 2 ARDF Coordinator Ken Harker WM5R. Keep checking this Homing In site for the latest radio-orienteering news for the USA and all of North America. October 2000 -- USA Foxhunting Championships 2001 -- Start Planning! The above references will increase your understanding of international style ARDF and help you plan hunts in your area. For technical and equipment ARDF references, see the Equipment Ideas for Radio-Orienteering page at this site. The International Amateur Radio Union (IARU) is a federation of the national Amateur Radio Societies of 146 countries around the world, working together for the international good of Amateur Radio. IARU was formed in Paris, France in 1925 and has become the watchdog and spokesman for the world Amateur Radio community. There are no individual members of IARU, only national Member-Societies such as the American Radio Relay League (USA), Associazione Radioamatori Italiani (Italy), and Federacion Mexicana de Radio Experimentadores (Mexico). ARRL is a member society of IARU Region 2, of course. USA is also a member society of IARU Region 3, by virtue of the US territories, such as Guam, that are located in Region 3. IARU's headquarters (the International Secretariat) is located at the ARRL building in Newington, Connecticut, USA. The current IARU President is Timothy Ellam VE6SH of Canada. The International Secretary is David Sumner K1ZZ of the USA.